Graphs and Numerical Display for Paperless Datalogging. 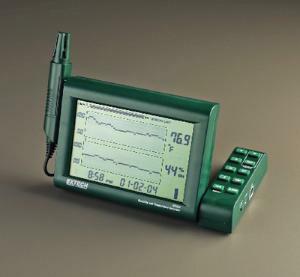 Ideal for recording humidity and temperature over long durations, this digital hygrometer stores readings with a date and time stamp to later transfer to a computer for further analysis. The information stored is simultaneously displayed on the recorder at all times — humidity, temperature, dew point, date, time, and min/max values. Recordings are shown in numerical and graphical form, with a programmable graph resolution. This cost–effective recording eliminates the need for replacement charts and pens.